I stamped my fairy with black brilliance onto white card and coloured with promarkers. I cut a piece of heavy acetate (packaging) to size and used alcohol inks to create a watery feel. I stamped the fairy again onto thin acetate and painted the reverse with cosmic shimmer and cut around the wings so that they would stand out. I attached the images with brads and then mounted onto the card with foam pads. The sentiment was computer generated and printed directly onto my card. I added a small ribbon knot just to balance the proportions. I have posted 2 photos so that the wings can be seen raised from the card. The 1st photo is truer to the colours I used but it's difficult with acetate as everyone else seems to have found. I love the look of your aqua background Val,super job with the alcohol inks, however the positioning of that element looks a little strange in the corner without much of the base card visible on the left side. What do you think? If you trimmed the card closer to the sentiment on the right, it might balance things a little more. It's a very pretty image,you've done great work with this difficult substance! I love the background also that you have created on your acetate, great colour scheme and fab sentiment. This is gorgeous! I had forgotten the beauty of alcohol inks!! Love it! Wow this is super , love your work with the inks and the image is fantastic . Love the watery effect it has. 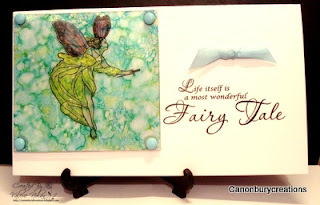 Gorgeous card, love the fairy sentiment. The fairy looks wonderful on that amazing background! What a beautiful card! I love what you've done with the alcohol inks! Beautiful card...love the background...must have a play with my inks :0). This card is lovely Val. I really like the colours and the sentiment. What font did you use? I think Chrissie is right - the sentiment looks a little unbalanced and I would have trimmed the right hand edge a bit to even it up. I love the way you've made the watery feel on the acetate - very pretty. The image is just lovely! 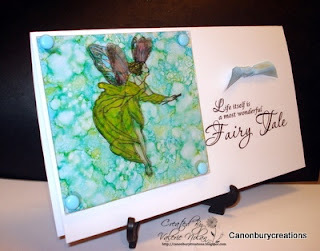 This is such a lovely card and i adore using accetate with alcohol inks as it gives such a great effect.havent done it for a long long time so i think ill have to go give it another go.